The Burr–Hamilton duel was fought between prominent American politicians Aaron Burr, the sitting Vice President of the United States, and Alexander Hamilton, the former Secretary of the Treasury, at Weehawken, New Jersey on July 11, 1804. The duel was the culmination of a long and bitter rivalry between the two men. Burr shot and mortally wounded Hamilton, who was carried to the home of William Bayard on the Manhattan shore, where he died the next day with his wife and sister-in-law at his side. Philip Schuyler, Hamilton's father-in-law, lost his Senate seat to Burr. The Burr–Hamilton duel is one of the most famous personal conflicts in American history. It was a draw duel which arose from long-standing personal bitterness that developed between the two men over the course of several years. 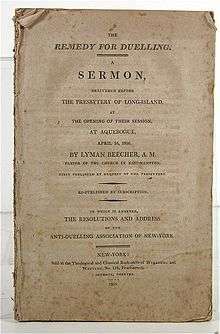 Tensions reached a boiling point with Hamilton's journalistic defamation of Burr's character during the 1804 New York gubernatorial race in which Burr was a candidate. The duel was fought at a time when the practice was being outlawed in the northern United States, and it had immense political ramifications. Burr survived the duel and was indicted for murder in both New York and New Jersey, though these charges were later either dismissed or resulted in acquittal. The harsh criticism and animosity directed toward him following the duel brought an end to his political career. The Federalist Party, already weakened by the defeat of John Adams in the presidential election of 1800, was further weakened by Hamilton's death. The duel was the final skirmish of a long conflict between Democratic-Republicans and Federalists. 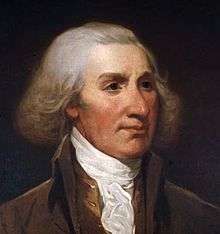 The conflict began in 1791 when Burr won a United States Senate seat from Philip Schuyler, Hamilton's father-in-law, who would have supported Federalist policies. (Hamilton was the Secretary of the Treasury at the time.) The Electoral College then deadlocked in the election of 1800, during which Hamilton's maneuvering in the House of Representatives caused Thomas Jefferson to be named president and Burr vice-president. "Nothing has given me so much chagrin as the Intelligence that the Federal party were thinking seriously of supporting Mr. Burr for president. I should consider the execution of the plan as devoting the country and signing their own death warrant. Mr. Burr will probably make stipulations, but he will laugh in his sleeve while he makes them and will break them the first moment it may serve his purpose." In a more extensive letter written shortly afterward, Hamilton details the many charges that he has against Burr, calling him a "profligate, a voluptuary in the extreme”, accusing him of corruptly serving the interests of the Holland Land Company while a member of the legislature, criticizing his military commission and accusing him of resigning under false pretenses, and many more serious accusations. Morgan Lewis, endorsed by Hamilton, defeated Burr in the 1804 New York gubernatorial election. It became clear that Jefferson would drop Burr from his ticket in the 1804 election, so the Vice President ran for the governorship of New York instead. Hamilton campaigned vigorously against Burr, who was running as an independent, causing him to lose to Morgan Lewis, a Democratic-Republican endorsed by Hamilton. Both men had been involved in duels in the past. Hamilton had been a principal in 10 shotless duels prior to his fatal encounter with Burr, including duels with William Gordon (1779), Aedanus Burke (1790), John Francis Mercer (1792–1793), James Nicholson (1795), James Monroe (1797), and Ebenezer Purdy/George Clinton (1804). He also served as a second to John Laurens in a 1779 duel with General Charles Lee, and to legal client John Auldjo in a 1787 duel with William Pierce. Hamilton also claimed that he had one previous honor dispute with Burr; Burr stated that there were two. Burr and Hamilton first came into public opposition during the United States presidential election of 1800. Burr ran for Vice President on the Democratic-Republican ticket, along with presidential candidate Thomas Jefferson, against President John Adams (the Federalist incumbent) and his vice presidential running mate Charles C. Pinckney. Electoral College rules at the time gave each elector two votes for president; the candidate who received the second most votes became vice president. The Democratic-Republican Party, therefore, planned to have 72 of their 73 electors vote for both Jefferson and Burr, with the remaining elector voting only for Jefferson. However, the electors failed to execute this plan, so Burr and Jefferson tied with 73 votes each. The Constitution stipulates that, if no candidate wins a majority, the election is moved to the United States House of Representatives—which was controlled by the Federalists, at this point, many of whom were loathe to vote for Jefferson. Hamilton, however, regarded Burr as far more dangerous than Jefferson and used all his influence to ensure Jefferson's election. On the 36th ballot, the House of Representatives gave Jefferson the presidency, with Burr becoming vice president. On April 24, 1804, a letter was published in the Albany Register in the context of opposing Burr's candidacy. It was originally sent from Dr. Charles D. Cooper to Hamilton's father-in-law, former U.S. Sen. Philip Schuyler, and made reference to a previous statement by Cooper: "General Hamilton and Judge Kent have declared in substance that they looked upon Mr. Burr to be a dangerous man, and one who ought not be trusted with the reins of government." Cooper went on to emphasize that he could describe in detail "a still more despicable opinion which General Hamilton has expressed of Mr. Burr" at a political dinner. Burr responded in a letter delivered by William P. Van Ness, pointing particularly to the "more despicable" phrase, and demanded "a prompt and unqualified acknowledgment or denial of the use of any expression which would warrant the assertion of Dr. Cooper." Hamilton's verbose reply on June 20, 1804 indicated that he could not be held responsible for Cooper's interpretation of his words (yet did not fault that interpretation), concluding that Hamilton would "abide the consequences" should Burr remain unsatisfied. A recurring theme in their correspondence is that Burr seeks avowal or disavowal of anything that could justify Cooper's characterization, while Hamilton protests that there are no specifics. General Hamilton says he cannot imagine what Dr. Cooper may have alluded, unless it were to a conversation at Mr. Taylor's, in Albany, last winter (at which he and General Hamilton were present). General Hamilton cannot recollect distinctly the particulars of that conversation, so as to undertake to repeat them, without running the risk of varying or omitting what might be deemed important circumstances. The expressions are entirely forgotten, and the specific ideas imperfectly remembered; but to the best of his recollection it consisted of comments on the political principles and views of Colonel Burr, and the results that might be expected from them in the event of his election as Governor, without reference to any particular instance of past conduct or private character. Eventually, Burr issued a formal challenge, and Hamilton accepted. Many historians have considered the causes of the duel to be flimsy and have thus either characterized Hamilton as "suicidal", Burr as "malicious and murderous," or both. Thomas Fleming offers the theory that Burr may have been attempting to recover his honor by challenging Hamilton, whom he considered to be the only gentleman among his detractors, in response to the slanderous attacks against his character published during the 1804 gubernatorial campaign. Burr, William P. Van Ness (his second), Matthew L. Davis, and another (often identified as John Swarthout) plus their rowers reached the site at 6:30, whereupon Swarthout and Van Ness started to clear the underbrush from the dueling ground. Hamilton, Judge Nathaniel Pendleton (his second), and Dr. David Hosack arrived a few minutes before seven. Lots were cast for the choice of position and which second should start the duel; both were won by Hamilton's second, who chose the upper edge of the ledge (which faced the city) for Hamilton. However, according to historian and author Joseph Ellis, Hamilton had been challenged and therefore had choice of both weapon and position. Under this account, it was Hamilton himself who chose the upstream or north side position. All first-hand accounts of the duel agree that two shots were fired; however, Hamilton and Burr's seconds disagreed on the intervening time between the shots. It was common for both principals in a duel to fire a shot at the ground to exemplify courage, and then the duel could come to an end. Hamilton apparently fired first and into the air, though it is not clear whether this was intentional, much less whether Burr perceived him to be "throwing away his shot" (as it did not follow the standard protocol). Burr returned fire and hit Hamilton in the lower abdomen above the right hip. The large-caliber lead ball ricocheted off Hamilton's third or second false rib, fracturing it, and caused considerable damage to his internal organs, particularly his liver and diaphragm, before becoming lodged in his first or second lumbar vertebra. According to Pendleton's account, Hamilton collapsed immediately, dropping the pistol involuntarily, and Burr moved toward Hamilton in a speechless manner (which Pendleton deemed to be indicative of regret) before being hustled away behind an umbrella by Van Ness because Hosack and the rowers were already approaching. Hamilton did fire his weapon intentionally, and he fired first. But he aimed to miss Burr, sending his ball into the tree above and behind Burr's location. In so doing, he did not withhold his shot, but he did waste it, thereby honoring his pre-duel pledge. Meanwhile, Burr, who did not know about the pledge, did know that a projectile from Hamilton's gun had whizzed past him and crashed into the tree to his rear. According to the principles of the code duello, Burr was perfectly justified in taking deadly aim at Hamilton and firing to kill. But did he? What is possible, but beyond the reach of the available evidence, is that Burr really missed his target, too, that his own fatal shot, in fact, was accidental. When called to him upon his receiving the fatal wound, I found him half sitting on the ground, supported in the arms of Mr. Pendleton. His countenance of death I shall never forget. He had at that instant just strength to say, 'This is a mortal wound, doctor;' when he sunk away, and became to all appearance lifeless. I immediately stripped up his clothes, and soon, alas I ascertained that the direction of the ball must have been through some vital part. His pulses were not to be felt, his respiration was entirely suspended, and, upon laying my hand on his heart and perceiving no motion there, I considered him as irrecoverably gone. I, however, observed to Mr. Pendleton, that the only chance for his reviving was immediately to get him upon the water. We therefore lifted him up, and carried him out of the wood to the margin of the bank, where the bargemen aided us in conveying him into the boat, which immediately put off. During all this time I could not discover the least symptom of returning life. I now rubbed his face, lips, and temples with spirits of hartshorn, applied it to his neck and breast, and to the wrists and palms of his hands, and endeavoured to pour some into his mouth. Soon after recovering his sight, he happened to cast his eye upon the case of pistols, and observing the one that he had had in his hand lying on the outside, he said, "Take care of that pistol; it is undischarged, and still cocked; it may go off and do harm. Pendleton knows" (attempting to turn his head towards him) 'that I did not intend to fire at him.' 'Yes,' said Mr. Pendleton, understanding his wish, 'I have already made Dr. Hosack acquainted with your determination as to that' He then closed his eyes and remained calm, without any disposition to speak; nor did he say much afterward, except in reply to my questions. He asked me once or twice how I found his pulse; and he informed me that his lower extremities had lost all feeling, manifesting to me that he entertained no hopes that he should long survive. Pendleton and Van Ness issued a press statement about the events of the duel. The statement printed out the agreed upon dueling rules and events that transpired, that being given the order to present, both participants were free to open fire. After first fire had been given, the opposite's second would count to three and the opponent would fire, or sacrifice his shot. Pendleton and Van Ness disagree as to who fired the first shot, but concur that both men had fired "within a few seconds of each other" (as they must have: neither Pendleton nor Van Ness mention counting down). "They [Mr. Pendleton and an accomplice] ascertained that the ball passed through the limb of a cedar tree, at an elevation of about twelve feet and a half, perpendicularly from the ground, between thirteen and fourteen feet from the mark on which General Hamilton stood, and about four feet wide of the direct line between him and Col. Burr, on the right side; he having fallen on the left." Hamilton wrote a letter the night before the duel entitled Statement on Impending Duel with Aaron Burr in which he stated that he was "strongly opposed to the practice of dueling" for both religious and practical reasons. "I have resolved," it continued, "if our interview is conducted in the usual manner, and it pleases God to give me the opportunity, to reserve and throw away my first fire, and I have thoughts even of reserving my second fire." Hamilton regained consciousness after being shot, and told Dr. Hosack that his gun was still loaded and that "Pendleton knows I did not mean to fire at him." This is evidence for the theory that Hamilton intended not to fire, honoring his pre-duel pledge, and only fired accidentally upon being hit. Such an intention would have violated the protocol of the code duello. When Burr later learned of this, he responded: "Contemptible, if true." Hamilton could have thrown his shot away by firing into the ground, thus possibly signaling Burr of his purpose. Hamilton performed a series of deliberately provocative actions to ensure a lethal outcome. As they were taking their places, he asked that the proceedings stop, adjusted his spectacles, and slowly, repeatedly, sighted along his pistol to test his aim. It has also been claimed that Hamilton also made a conspicuous choice of dueling pistols, choosing the same pair which had shot a button off Aaron Burr's coat some five years earlier during a duel with Hamilton's brother-in-law John Barker Church (Chernow describes this assertion as a 'legend', pointing out Burr's own statement that the pistols used in the duel with Church were his own and not Church's). These details have caused many historians in recent years to re-examine the circumstances of the engagement and Hamilton's true intentions on the morning of July 11. Subsequent examination of the pistols used by Hamilton has revealed that they were fitted with a "hair trigger." This would have brought considerable advantage in aiming accurately. Hamilton may have been unfamiliar with their use, and a mistake in arming them may have caused the gun to fire prematurely. This may have been the cause of Hamilton's errant first shot. If so, such a scenario would contradict the account that Hamilton fired into the air intentionally. There is little doubt that Burr had every intention of seeking full satisfaction from Hamilton by blood. The afternoon after the duel, Burr was quoted as saying that had his vision not been impaired by the morning mist, he would have shot Hamilton in the heart. According to the account of noted English philosopher Jeremy Bentham, who met with Burr in England in 1808 (four years after the fact), Burr claimed to have been certain of his ability to kill Hamilton, and Bentham concluded that Burr was "little better than a murderer." Towards the end of his life, Burr remarked: "Had I read Sterne more and Voltaire less, I should have known the world was wide enough for Hamilton and me." There is, however, much evidence in Burr's defense. Had Hamilton apologized for his "more despicable opinion of Mr. Burr", all would have been forgotten. However neither principal could avoid the confrontation honorably, and thus each was forced into the duel: Burr to regain his honor and Hamilton to sustain his. Furthermore, Burr was unsure of Hamilton's intentions (as historians still are today). Seeing Hamilton fire into the brush above his head, Burr could not be sure if Hamilton had thrown away his shot or simply missed his target. According to the principles of the code duello, Burr was entirely justified in taking aim at Hamilton, under the hypothesis that Hamilton had shot first. Continuing this line of reasoning, it is not clear that Burr did more than react to hearing Hamilton fire before he had any time to realize where the shot had gone. Burr certainly knew of Hamilton's publicly opposing his ascension to the vice-presidency in 1800. Hamilton made confidential statements against him, such as those enumerated in Hamilton's private letter to Supreme Court Justice Rutledge. In the attachment to that letter, Hamilton had argued against Burr's character on repetitive scores, for example "suspected on strong grounds of having corruptly served the views of the Holland Company ... his very friends do not insist on his integrity ... he will court and employ able and daring scoundrels ... his conduct indicates [he seeks] Supreme power in his own person ... will in all likelihood attempt a usurpation." Others have attributed Hamilton's apparent misfire to the design of the Wogdon duelling pistols (both of which survive today), which incorporated a hair-trigger feature that could be pre-set by the user. Hamilton, familiar with the weapons, would have known about and been able to use the hair trigger. However, when asked by Pendleton before the duel if he would use the "hair-spring", Hamilton reportedly replied, "not this time." The "hair-spring" feature gave an advantage because it reduced the force required to engage the trigger, preventing unintentional hand movement while firing. The pistols belonged to Hamilton's brother-in-law John Barker Church, who was a business partner of both Hamilton and Burr. Later legend claimed that these pistols were the same ones used in a 1799 duel between Church and Burr, in which neither man was injured. Aaron Burr, however, claimed in his memoirs that he supplied the duelling pistols for his duel with Church, and that they belonged to him. Hamilton biographer Ron Chernow accepts Burr's version of the story. In 1801, Hamilton's son Philip used the Church weapons in the duel in which he died. 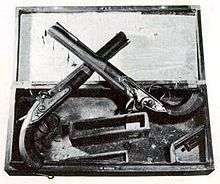 The pistols reposed at Church's estate Belvidere until the late 19th century. In 1930, the pistols were sold to the Chase Manhattan Bank, now part of JPMorgan Chase & Co. and are on display in the investment bank's headquarters at 270 Park Avenue in New York City. The mortally wounded Hamilton died the following day with his wife by his side and was buried in the Trinity Churchyard Cemetery in Manhattan (Hamilton was an Episcopalian at his death). Gouverneur Morris, a political ally of Hamilton's, gave the eulogy at his funeral and established a private fund to support his widow and children. Burr was charged with murder in New York and New Jersey, but neither charge reached trial. In Bergen County, New Jersey, a grand jury indicted Burr for murder in November 1804, but the New Jersey Supreme Court quashed the indictment on a motion from Colonel Ogden. Burr fled to Saint Simons Island, Georgia. 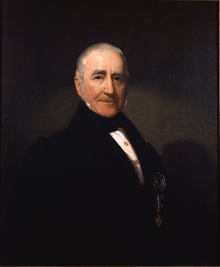 He stayed at the plantation of Pierce Butler at Hampton Point, but soon returned to Washington, D.C. to complete his term of service as Vice President. He presided over the Samuel Chase impeachment trial "with the dignity and impartiality of an angel, but with the rigor of a devil" according to a Washington newspaper. Burr's heartfelt farewell speech in March 1805 moved some of his harshest critics in the Senate to tears. With his political career apparently over, Burr went west, where he became involved in "filibuster" plans, which some later claimed were intended to establish a new independent empire carved out of the Louisiana territory. General James Wilkinson, who had worked with Burr, later had a change of heart and betrayed their plans to President Jefferson. Another man Burr allegedly tried to recruit, William Eaton, accused Burr in letters to Jefferson, resulting in Burr's arrest and trial for treason. Although he was acquitted of all charges, Burr's reputation was further damaged and he spent the following years in Europe. He finally returned to New York City in 1812, where he resumed his law practice and spent the remainder of his life in relative obscurity. The first memorial to the duel was constructed in 1806 by the Saint Andrew's Society, of which Hamilton was formerly a member. A 14-foot marble cenotaph, consisting of an obelisk topped by a flaming urn and a plaque with a quote from Horace surrounded by an iron fence, was constructed approximately where Hamilton was believed to have fallen. Duels continued to be fought at the site and the marble was slowly vandalized and removed for souvenirs, leaving nothing remaining by 1820. The memorial's plaque survived, turning up in a junk store and finding its way to the New-York Historical Society in Manhattan, where it still resides. From 1820 to 1857, the site was marked by two stones with the names Hamilton and Burr placed where they were thought to have stood during the duel. When a road from Hoboken to Fort Lee was built through the site in 1858, an inscription on a boulder where a mortally wounded Hamilton was thought to have rested—one of the many pieces of graffiti left by visitors—was all that remained. No primary accounts of the duel confirm the boulder anecdote. In 1870, railroad tracks were built directly through the site, and the boulder was hauled to the top of the Palisades, where it remains today. In 1894, an iron fence was built around the boulder, supplemented by a bust of Hamilton and a plaque. The bust was thrown over the cliff on October 14, 1934 by vandals and the head was never recovered; a new bust was installed on July 12, 1935. The plaque was stolen by vandals in the 1980s and an abbreviated version of the text was inscribed on the indentation left in the boulder, which remained until the 1990s when a granite pedestal was added in front of the boulder and the bust was moved to the top of the pedestal. New markers were added on July 11, 2004, the 200th anniversary of the duel. The duel is portrayed in the songs "Your Obedient Servant" and "The World Was Wide Enough" from the Broadway musical Hamilton. The musical compresses the timeline for their grievance, depicting Burr's challenge as a result of Hamilton's endorsement of Jefferson rather than the gubernatorial election. In Hamilton, the duel is the penultimate scene, before the show's finale is sung. In his historical novel Burr (1973), author Gore Vidal depicts an elderly Aaron Burr returning to the dueling ground in Weehawken thirty years after the fateful event. Burr then acts out the duel for the novel's protagonist before describing the personal consequences he would endure in its immediate aftermath. Vidal alleges that the reason Burr challenged Hamilton to the duel was that Hamilton had publicly accused Burr of having incestuous sexual relations with his (Burr's) daughter. A famous "GOT MILK?" commercial highlighted the Hamilton-Burr Duel. The ad, directed by Michael Bay and created by Goodby Silverstein & Partners, won a Gold Clio Award in 1994 and was inducted into the Clio Hall of Fame in 2009. 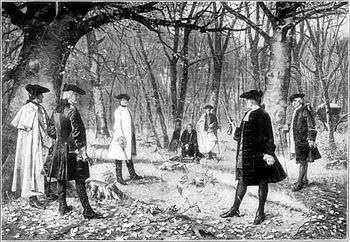 In 2004, for the duel's bicentennial anniversary, kin of Burr and Hamilton held re-enactment of the famous duel, near the Hudson River. 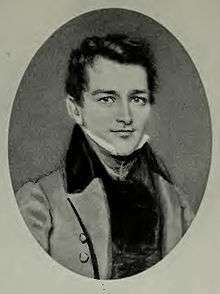 In the re-enactment, Douglas Hamilton, fifth-great-grandson of Alexander Hamilton, faced Antonio Burr, a descendant of Aaron Burr’s cousin. More than 1,000 people attended the re-enactment, including an estimated 60 descendants of Hamilton and 40 members of the Aaron Burr Association. Since 2012, around the 11,12 and 14 of July each year, the Alexander Hamilton Awareness Society has been hosting the CelebrateHAMILTON program, to commemorate the Burr-Hamilton Duel and Alexander Hamilton's life and legacy with events at the Hamilton Memorial overlooking the duel site and other locations in Weehawken, including “Not throwing away any shots: Understanding the Burr-Hamilton duel", a presentation by History Professor at Yale, Dr. Joanne Freeman at Elk's Lodge, Weehawken, NJ as part of the CelebrateHAMILTON 2015. ↑ See, for example, "Jefferson is in every view less dangerous than Burr": Hamilton on the election of 1800 (Letter from Alexander Hamilton to Harrison Gray Otis, December 23, 1800). 1 2 Bernard C. Steiner and James McHenry, The life and correspondence of James McHenry (Cleveland: Burrows Brothers Co., 1907). ↑ Freeman, 1996, pp. 294–295. ↑ Nathaniel Pendleton to Van Ness. June 26, 1804. Hamilton Papers, 26:270. ↑ Burr to Charles Biddle; July 18, 2004. Papers of Aaron Burr, 2: 887. ↑ Additionally, Hamilton's son Philip was killed in a November 23, 1801 duel with George I. Eacker, initiated after Philip and his friend Richard Price engaged in "hooliganish" behavior in Eacker's box at the Park Theatre. This was in response to a speech that Eacker had made on July 3, 1801 that was critical of Hamilton. Philip and his friend both challenged Eacker to duels when he called them "damned rascals" (Fleming, 1999, pp. 7–9). Price's duel (also at Weehawken) resulted in nothing more than four missed shots, and Hamilton advised his son to delope (throw away his shot). However, both Philip and Eacker stood shotless for a minute after the command "present", then Philip leveled his pistol, causing Eacker to fire, mortally wounding Philip and sending his shot awry. ↑ Cooper, Charles D. April 24, 1804. Albany Register. ↑ Cooper to Philip Schuyler. Hamilton Papers. April 23, 1804. 26: 246. ↑ Life of Alexander Hamilton. Retrieved April 20, 2015. ↑ "From Alexander Hamilton to Aaron Burr, 20 June 1804". Founders.archives.gov. 2016-06-29. Retrieved 2016-07-09. ↑ "To Alexander Hamilton from Aaron Burr, 21 June 1804". Founders.archives.gov. 2016-06-29. Retrieved 2016-07-09. ↑ "From Alexander Hamilton to Aaron Burr, 22 June 1804". Founders.archives.gov. 2016-06-29. Retrieved 2016-07-09. ↑ Winfield, 1875, pp. 216–217. ↑ Winfield, 1875, p. 217. ↑ Freeman, 1996, p. 290. 1 2 Buescher, John. "Burr-Hamilton Duel." Teachinghistory.org. Accessed July 11, 2011. ↑ Demontreux, 2004, p. 3. 1 2 Winfield, 1874, p. 219. ↑ Winfield, 1874, pp. 219–220. ↑ William P. Van Ness vs. The People. 1805. 1 2 "Document: Joint statement on the Duel < A Biography of Alexander Hamilton (1755-1804) < Biographies < American History From Revolution To Reconstruction and beyond". Odur.let.rug.nl. Retrieved 2016-07-09. ↑ The letter is not dated, but the consensus among Hamilton's contemporaries (including Burr) and historians suggests that it was written July 10, 1804, the night before the duel. See: Freeman, 1996, note 1. ↑ Ogden, 1979, p. 60. ↑ Burr, Aaron; Davis, Matthew Livingston (1837). Memoirs of Aaron Burr: With Miscellaneous Selections from His Correspondence, Volume 1. Harper & Brothers. p. 417. Retrieved 11 February 2016. ↑ "Smithsonian magazine article". Aaronburrassociation.org. Retrieved 2016-07-09. ↑ Winfield. 1874. p. 220. ↑ N.Y. Spectator. July 28, 1824. ↑ Sabine. 1857. p. 212. ↑ "The Fateful Encounter". AmericanHeritage.com. Retrieved April 20, 2015. ↑ Steven C. Smith. My Friend Hamilton-Whom I Shot Archived November 27, 2007, at the Wayback Machine. ↑ The Century Illustrated Monthly Magazine. Retrieved April 20, 2015. ↑ For the United States Bicentennial anniversary in 1976, Chase Manhattan allowed the pistols to be removed and loaned to the U.S. Bicentennial Society of Richmond. A subsequent article in the Smithsonian magazine claimed that close examination of the pistols had revealed a secret hair trigger:"Pistols shed light on famed duel" (from the Smithsonian magazine; November 1976). However, for the preceding twenty years, English duelling pistols had been customarily fitted with hair triggers (known as set triggers). Pistols made by Robert Wogdon were no exception. They cannot therefore be said to have had 'secret' hair triggers: "The British Duelling Pistol"; John Atkinson, Arms and Armour Press; 1978. ↑ Memoirs of Aaron Burr, by Matthew L. Davis. ↑ Robert Bromeley and Mrs. Patrick W. Harrington (August 1971). "National Register of Historic Places Registration: Belvidere". New York State Office of Parks, Recreation and Historic Preservation. Retrieved 2009-06-14. See also: "Unfiled NHL Nomination Form for Villa Belvidere". ↑ "JPMorgan's Expanding Footprint". DealBook. The New York Times. March 16, 2008. Retrieved July 3, 2014. ↑ Centinel of Freedom. November 24 hi , 1807, cited in Winfield, 1874, p. 220. ↑ "1801: Indicted Vice President Bids Senate Farewell – March 2, 1805". May 29, 2014. Retrieved April 20, 2015. ↑ "Noted Members". St. Andrew's Society of New York. ↑ Demontreux, 2004, pp. 3–4. ↑ Demontreux, 2004, p. 4. ↑ Demontreux, 2004, p. 5. ↑ Demontreux, 2004, p. 6. ↑ Demontreux, 2004, pp. 7–9. ↑ "Aaron Burr Got Milk commercial". Bing.com. Retrieved 2016-07-08. ↑ "Aaron Burr Got Milk". Theinspirationroom.com. Retrieved 2016-07-17. ↑ "Hamilton, Burr kin re-enact famous, fatal duel". MSNBC. Retrieved April 20, 2015. ↑ Brenzel, Kathryn. "Burr killed Hamilton 211 years ago during famous duel in Weehawken". Nj.com. NJ Advance Media. Berg, Al and Sherman, Lauren. 2004. "Pistols at Weehawken." Weehawken Historical Commission. Chernow, Ron. Alexander Hamilton. The Penguin Press, 2004. Coleman, William. 1804. A Collection of Facts and Documents, relative to the death of Major-General Alexander Hamilton. New York. Cooke, Syrett and Jean G, eds. 1960. 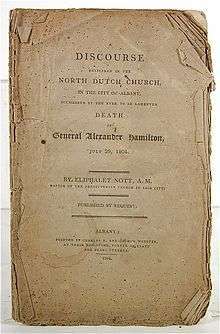 Interview in Weehawken: The Burr-Hamilton Duel as Told in the Original Documents. Middletown, Connecticut. Cooper to Philip Schuyler. April 23, 1804. 26: 246.
Cooper, Charles D. April 24, 1804. Albany Register. Davis, Matthew L. Memoirs of Aaron Burr (free ebook available from Project Gutenberg). Demontreux, Willie. 2004. "The Changing Face of the Hamilton Monument." Weehawken Historical Commission. Flagg, Thomas R. 2004. 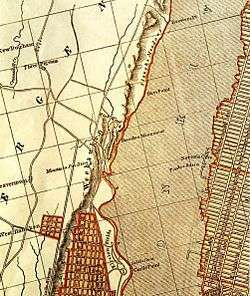 "An Investigation into the Location of the Weehawken Dueling Ground." Weehawken Historical Commission. Frazier, Ian. February 16, 2004. "Route 3." The New Yorker. Freeman, Joanne B. 1996. Dueling as Politics: Reinterpreting the Burr-Hamilton duel, The William and Mary Quarterly, 3rd series, 53 (2): 289–318. Hamilton, Alexander. "Statement on Impending Duel with Aaron Burr," [June 28 – July 10], 26: 278. Lindsay, Merrill. 1976. "Pistols Shed Light on Famed Duel." Smithsonian, VI (November): 94–98. McGrath, Ben. May 31, 2004. "Reënactment: Burr vs. Hamilton." The New Yorker. New-York Evening Post. July 17, 1804. "Funeral Obsequies." From the Collection of the New York Historical Society. Ogden, Thomas H. (1979). "On Projective Identifications," in International Journal of Psychoanalysis, 60, 357. Cf. Rogow, A Fatal Friendship, 327, note 29. PBS. 1996. American Experience: The Duel. Documentary transcript. Reid, John. 1898. "Where Hamilton Fell: The Exact Location of the Famous Duelling Ground." Weehawken Historical Commission. Rorabaugh, W.J. (1995). "The Political Duel in the Early Republic: Burr v. Hamilton". Journal of the Early Republic. 15 (1): 1–23. doi:10.2307/3124381. JSTOR 3124381. Sabine, Lorenzo. Notes on Duels and Duelling. Boston. Van Ness, William P. 1804. A Correct Statement of the Late Melancholy Affair of Honor, Between General Hamilton and Col. Burr. New York. William P. Ness vs. The People. January 1805. Duel papers, William P. Ness papers, New York Historical Society. Wilson, James Grant (1869). "The Weehawken Dueling Ground". Literature, Science, and Art. 1 (11): 339–340. Winfield, Charles H. 1874. History of the County of Hudson, New Jersey from Its Earliest Settlement to the Present Time. New York: Kennard and Hay. Chapter 8, "Duels." pp. 200–231. Duel 2004 – A site dedicated to the 200th anniversary of the duel.